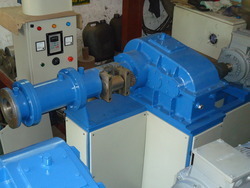 Modern is one of the leading manufacturers of Bull Gear Drive Rubber Mixing Mill. The entire range of rubber mixing mill is extensively used for quick homogenous blending of synthetic or natural rubbers with a variety of chemicals. 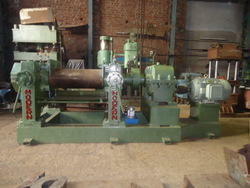 This type of rubber mixing mill is largely used for mixing and crude rubbers plasticate and rubber padding's soak. These Mills are Manufactured using high grade raw materials and are equipped with Anti Friction Roller Bearings which ensures high power saving, zero maintenance and better productivity. Compact Construction, maximum Floor Utilization. No continuous Lubrication required which saves lubrication cost. Equipped with Anti Friction Bearings so No wear & tear as in Bush Bearing type Machines. Modern Dispersion Kneader machine ensures uniform dispersion of compounds, easy cleaning for color change & simple operation and symbolizes techno-economic success. This kneader can be employed in a wide assortment of material mixing ranging from low viscosity adhesives to high viscosity rubber. The entire range of Dispersion Kneader has cooling jacket construction which thereby improves the mixing dispersion and prevents material from scorching. These kneaders promote cooling & low temperature mixing and are highly demanded in chemical, plastic and rubber industries. Modern Offers complete series of Standard Pneumatic Operated (Standard Model) and Hydraulic Operated (NO AIR COMPRESSOR REQUIRED) Dispersion Kneaders from 15 To 200 Liters Production Sizes in Front Feed – Front Discharge and Rear Feed – Front Discharge Models. Modern offers Rubber Extruders Which are extensively used for processing elastomeric compound for production of rubber strips, rubber profile, rubber channels, rubber chords, rubber tubing, rubber threads, Rubber Hoses, Recoating of Rubber Hoses, compound pre-heating for calendaring, Inner Tubes for bicycle, autos, cars & trucks and Tread Rubber Extrusion. Material Feed through undercut hopper with & without feed roller attachment. Constant Speed or Variable speed drive as per specific requirement. Full and Semi Uni Drive Extruders Eliminating Bull Gear and Pinion. Gearbox with hollow output shaft for screw cooling though Rotary Joint. Modern is one of the leading manufacturers of Rubber Mixing Mill. Uni Drive Rubber Mixing Mill with Anti friction roller bearings is extensively used for providing homogeneous composition of rubber with a variety of ingredients with the support of single drive. Simple to install and geared up to run, these Uni drive rubber mixing mill with Anti friction roller bearings ensures superior mixing performance at lower operating cost and zero maintenance. Superior Mixing Performance as no Friction Loss. Low Operating Cost with High Productivity. Latest Technology Update, Meets Current International Standards. No continuous Lubrication hence heavy saving on lubrication cost. Easy to Install & Ready to Run. No Deep Foundation Required. Looking for Rubber Mixing Mills ?